Local, organic Maine cranberries, from Sparrow Farm in Pittston. They are also veteran growers of fresh ginger, I just learned! I have nothing against Ocean Spray. I’m even a fan of their canned, jellied sauce, mostly for its gelatinous texture and the way it lies flat on a turkey and stuffing sandwich. But if you have access to fresh berries, it’s worth making your own cranberry sauce. And you don’t even have to occupy a precious burner on your crowded Thanksgiving stove-top. 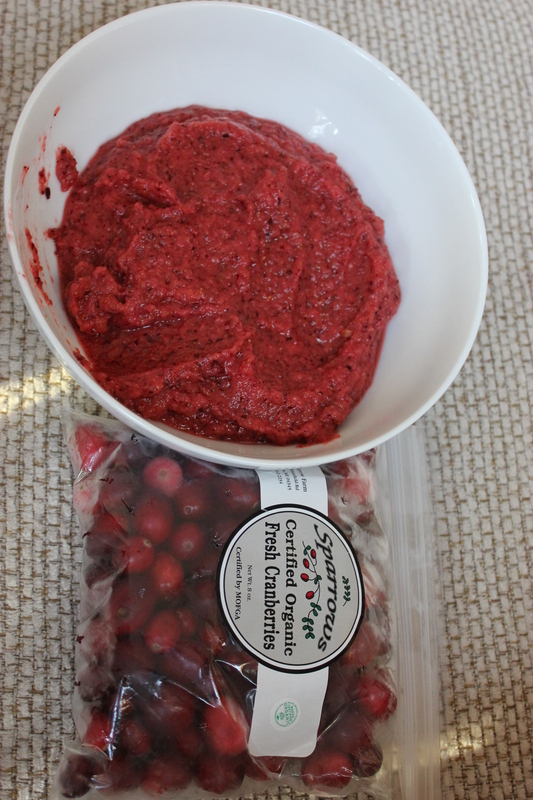 My favorite cranberry sauce recipe, which I’ve made for years now, is raw, and better yet, sugar-free. This sauce is sweetened with only oranges, apples and dates and whipped up in a blender (preferably a high-powered one like a Vitamix). I often punch it up with orange zest, vanilla extract, cinnamon and nutmeg. I never knew the source of the recipe (see below), but it appears to come from Rose Lee Calabro, an old-school raw foodie. I wish I could remember which dear friend or magazine turned me on to this effortless approach. I’m excited to receive a pound of local Maine cranberries in our Small Wonder Organics CSA box next week. They’ll be from Sparrow Farm in Pittston, which I also hear has been growing fresh ginger for years. Maybe I’ll finally try Mama Stamberg’s infamous cranberry relish this year. Process cranberries, orange, apple and dates in a blender and serve.